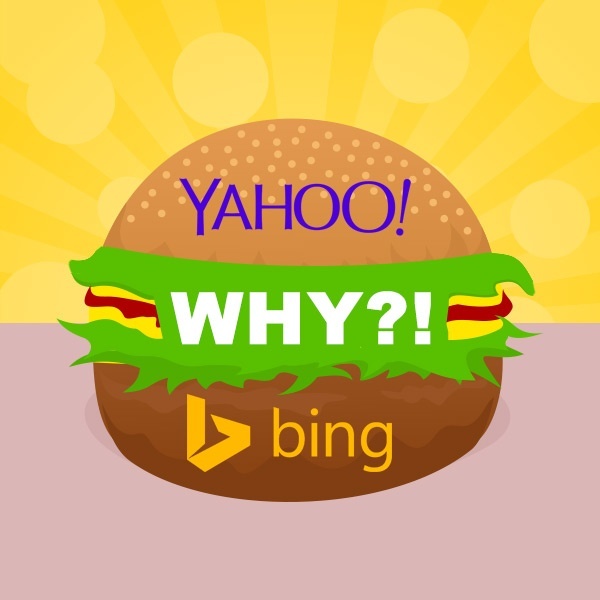 Keyword Ranking in Google but not Bing or Yahoo, WHY!? Working in a web marketing firm comes with a set of frustrations unique, I think, to just about any other vocation. We work tirelessly to get to know each of our clients, then get as granular as possible with keyword research, optimizing each website with original, keyword-targeted content in an attempt to increase page rank for each of their most valuable search terms. We keep our eyes on web periodicals like MOZ to ensure that we’re up to date with the latest Google algorithms, ensuring that we’re always ahead of the game in our strategy. If all of this sounds familiar to you, you probably work in an agency too, and also subscribe to the seemingly commonplace truth that Google is king. Google maintains 67.6% of the U.S. search engine market share while Bing (which owns Yahoo) has 18.7% and Yahoo has less than 10%. Recently one of my coworkers mentioned to the team that one of her clients was showing considerable growth in keyword ranking on Google. In between 30 and 60 days following their last round of optimization, their keywords had all shot to page one of Google search results. This is, of course, wonderful news, but what she said next confused us all. Although this client looked like a million bucks in Google, they were lower than low in Yahoo and Bing, and by that I mean not even ranking. For those of you who work in the industry, you’re probably nodding vigorously because this is becoming increasingly common, and with some investigation, I can offer a few reasons why this mind-boggling disconnect occurs. Those who know me know that I explain almost everything using analogies. I guess I do this because comparing something to a more familiar thing seems to help people gain a genuine understanding of the concept, no matter how complex. Without further ado, I’m going to do just that. Let’s compare Google to a five-star, super high-end restaurant whose praises are sung by top chefs and celebrities alike. Their fois gras gets glowing accolades in everything from Conde Nast to Yelp. Now pretend that the same fois gras is sold at McDonald’s, where the nuances of its flavor and the artisanal way it’s made mean nothing to the diners who are just looking for a cheap burger. Moreover, McDonald’s doesn’t give a darn about marketing the stuff, because they know that selling chicken nuggets and fries will be much more cost effective. If you hadn’t already guessed, in this analogy Yahoo and Bing are McDonalds, and your beautifully optimized site is that rich and stunning fois gras. In my research to find the root of the disconnect between Google and Bing/Yahoo rankings, one thing became clear immediately. While Google’s algorithm is so current it’s almost annoying, when is the last time you heard of Yahoo or Bing updating theirs? While Google loves new websites who are doing things properly, Bing and Yahoo admittedly ADORE ancient sites, especially those with official-sounding domain names ending with .gov or .edu, which is awesome if you’re a school or the government, and terrible if you’re anyone else. To stick with its preference for antiques, Bing/Yahoo also happily index and favor sites which feature media requiring a Flash player plugin, which in turn requires you to use a computer which is older than yourself. To put the icing on the cake, Bing/Yahoo flat out doesn’t give a darn about your content, optimization, or keywords (at least for now). Their bots have the reading ability of a first grader, so they don’t understand if you’re using the word “fiberglass dory”, and will instead favor sites using the simplest possible keyword to describe what you sell, like “boat” for example. For every SEO who is shaking their head, trying to figure out how they can possibly optimize their site for both Google and Bing/Yahoo, the answer is relatively simple. Make Google your primary focus because it values innovation and hard work! Since in most cases Bing/Yahoo seems late to the game, with preferences which don't match Google's, you’d be doing yourself or your client a major disservice by trying to stoop to their level. Thinking about this in terms of our aforementioned analogy, as a high-end restaurant owner, would you really want to start serving cheaply made burgers, greasy fries, and mystery meat nuggets just to get the customers of the fast food place to come in? No, you wouldn’t. In fact, recently McDonald’s made the news because they’re going to start offering “healthier” options. Who knows how healthy they’ll actually be, but the point is that they’re doing this because people value quality. They value health. If you value the health and quality of your site, keep doing things right, per Google, and eventually, hopefully,Yahoo and Bing will start tightening up their algorithms, or risk becoming even more irrelevant than they already are.